For two days this month, taxi drivers didn’t pick up any weary travelers leaving Mineta San Jose Airport. 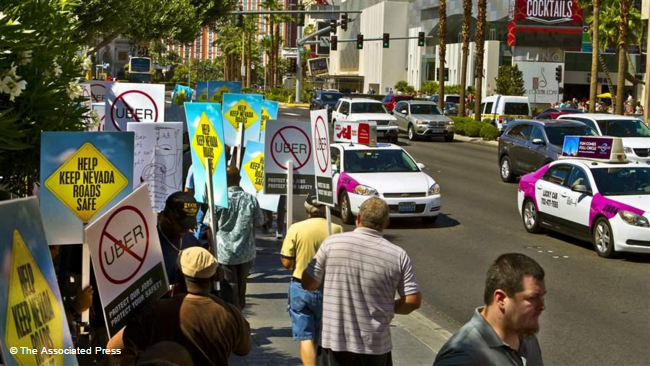 Instead they drove past, honking, and hoping their strike would persuade city leaders to make ride-hailing companies such as Uber and Lyft follow the same rules as taxi companies at the airport. “Either the city should deregulate us completely, like them … or regulate them at least closer to us, and let there be fair business competition,” said Kirpal Bajwa, a taxi driver and union leader. Ride-hailing companies, which connect paying passengers and drivers through a mobile app, deliver rides like a taxi service. But they’re not taxi companies, and states and cities are beginning to regulate them differently.